There are some special considerations regarding audio and video files. When importing an audio or video file, MAXQDA creates a new text document with the name of the media file and assigns the newly added document the inserted media file. The media file itself is stored in the MAXQDA external folder. If a file with the same name already exists in the Externals folder, MAXQDA asks if the existing file should be overwritten. You can adjust the location of the external address in the MAXQDA settings. The settings are called up via the gear wheel at the upper right edge of the window. 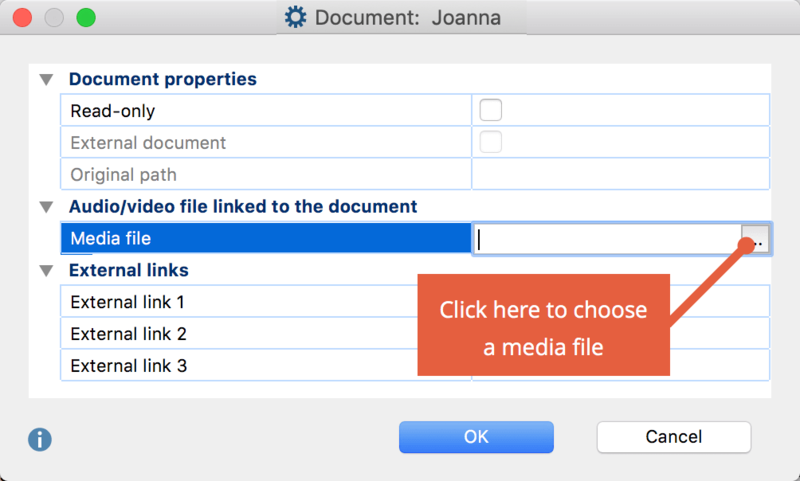 You can also assign a media file to an existing text document. To do this, right-click on the document in the “Documents System” and select Properties. Here a link to a media file can be assigned or changed at any time. To do this more quickly you can right-click on the document and choose Link Audio/Video file. Audio and video files can be played and edited in MAXQDA’s “Multimedia Browser”. For detailed information, see Analyzing Videos.